Today, I would like to share with you 5 postcards that I received recently. 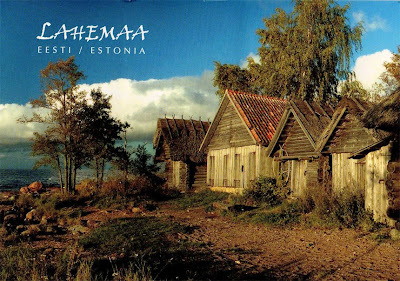 This beautiful postcard depicting Lahemaa National Park was sent from Estonia by Janek. Thank you very much! Lahemaa National Park (established 1971) is located on Northern Estonia, 70 kilometers east from capital Tallinn. Its area covers 725 km² (including 250.9 km² of sea). It was the first national park in the Soviet Union. The national park is one of the main tourism drawcards in Estonia. 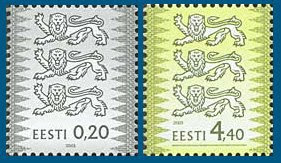 The stamp franked on the left belongs to the "Coat of Arms" series. 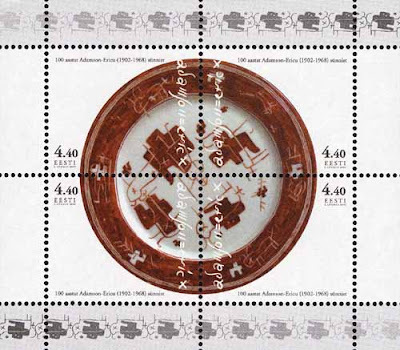 It is one of 2 definitive stamps issued on 22 August 2003. 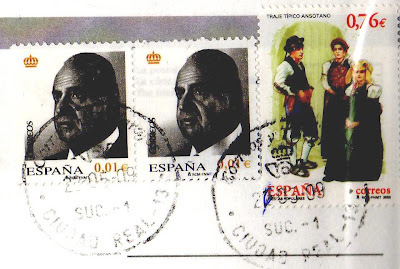 The 2 se-tenant stamps franked on the right of the cover was issued on 8 August 2002 to commemorate the 100th birth anniversary of Adamson-Eric. Adamson-Eric (1902-1968) was an Estonian artist who worked mainly within the medium of painting in applied art. Adamson's career as an artist spanned nearly four decades and there is currently a museum devoted to fine art called the Adamson-Eric Museum located on Lühike jalg Street in Tallinn, Estonia where many of Adamson-Eric's works are on permanent display. Next, is a postcard sent from lovely Malta. Many thanks to John Zarb! It is my first from Malta! * Hi John, pls send me an email (edmund.wsong@gmail.com) to confirm your mailing address... I can't see clearly as it was smudged by postmarks. Thanks. 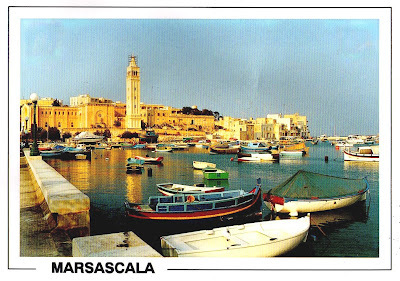 This card features Marsascala, a small and picturesque fishing village in the south-eastern region of Malta, situated within a deep inlet. The sea front is a lovely place for a stroll, to gaze at the fishing boats which crowd the bay. The beautiful stamp franked on this postcard belongs to a set of 4 stamps in the maritime series, entitled "Cruise liners". 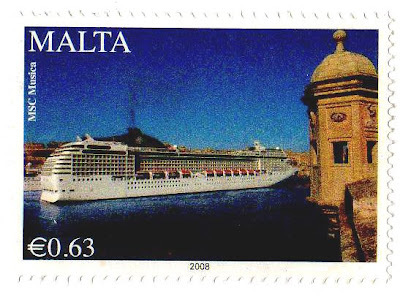 The stamps reproduce four world class liners that regularly visit Valletta Grand Harbour (a natural harbour on the island of Malta). The liners are MSC Musica, MS Voyager of the Seas, MS Westerdam, and obviously the RMS Queen Elizabeth 2. 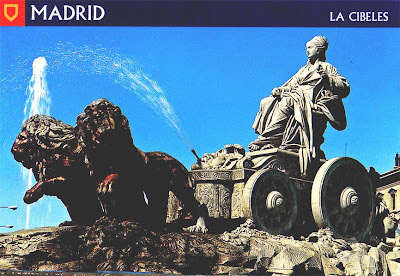 This third gorgeous postcard depicts the iconic Cibeles fountain, found in the Plaza de Cibeles of Madrid, Spain. Many thanks to Aurora! 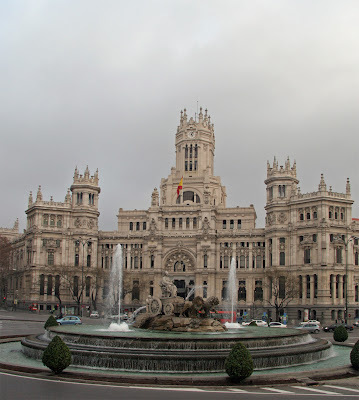 The fountain depicts the goddess Cybele, the symbol of earth, agriculture and fertility, on a chariot drawn by lions, and was designed by Ventura Rodríguez in the reign of Charles III of Spain. The marble fountain originally stood next to the Buenavista Palace in the Paseo de Recoletos, and was moved to its present location in the middle of the square in the late 19th century. This monument has now become a symbol for fans of the Real Madrid football club, who throng around the goddess to celebrate their victories. 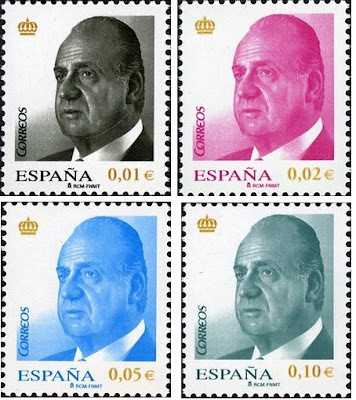 The 2 identical stamps franked on this lovely postcard are from the "H.M. King Juan Carlos I" Definitive series, issued on 2 January 2008. 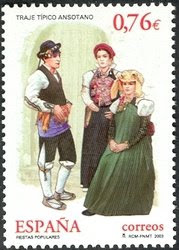 Next, we have a stamp from the "Popular Festivals" series, issued in 2003. It features Ansotano Dressings. 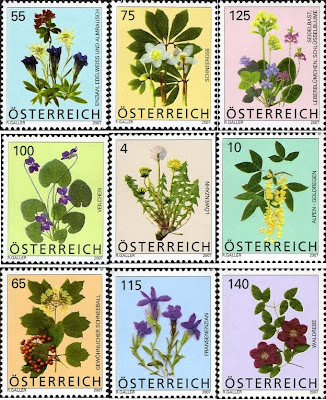 The fourth postcard for today was sent by postcrosser, Chris from Austria. Thank you! This beautiful postcard shows Wels, second largest city of the state of Upper Austria, located in the north of Austria, upon the Traun River near Linz. 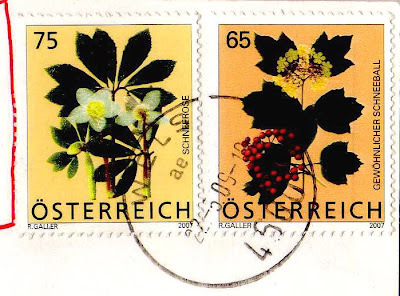 The 2 flower stamps franked on this lovely postcard was issued in 2007 as part of a set of definitive stamps from the "Flora - Flowers" series. 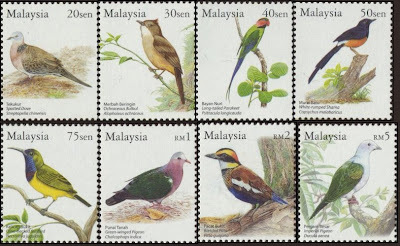 Last but not least, we have this awesome postcard sent from Perak, Malaysia. Once again, thanks to Khor Kok Keong! 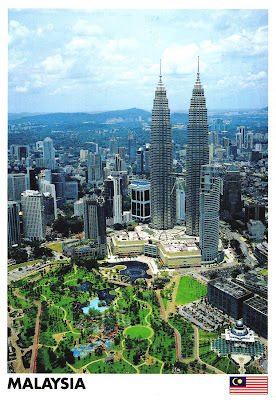 This great postcard offers us an awe-inspiring city view of Kuala Lumpur, Malaysia's capital. 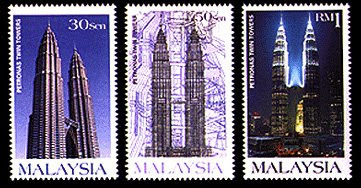 Here you can see the world's tallest building, Petronas Twin Tower. 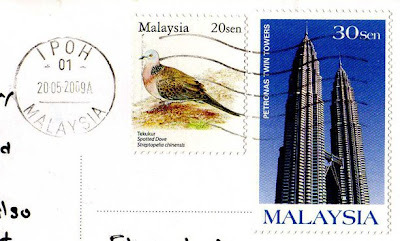 The 2 lovely stamps franked on this postcard feature a Spotted Dove (Birds of Malaysia Series, 2005) and Petronas Twin Tower (Petronas Twin Tower Series,1999). That's all I have for today. Till next post. Bye!